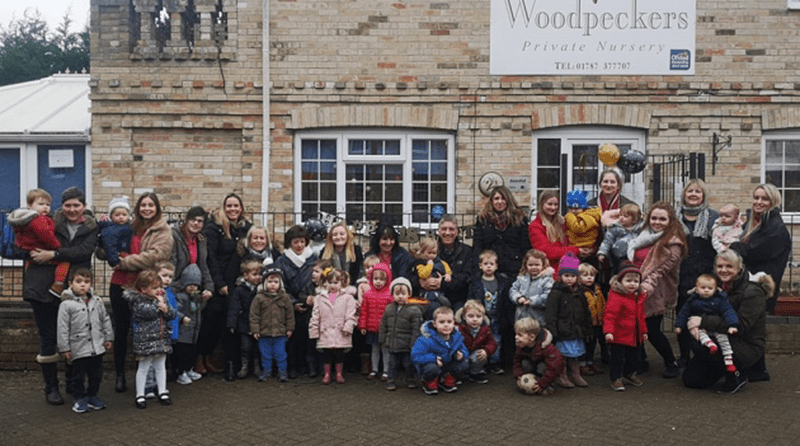 Woodpeckers Private Nursery celebrated their 18th birthday with a party. Opened by Deidre and Jeff Micklewright in 2001, the nursery has grown from providing care to just five children, to offering breakfast, after school and holiday clubs; extending rooms and renovating outside spaces; and adding a mud kitchen and a flock of chickens. Woodpeckers Private Nursery has cared for over 2000 children since the day they opened and was one of the first nurseries in the area to introduce Forest Schools to children. They also collaborated with community wardens to teach children to respect their community and environment through litter picks. The nursery also played a significant role in introducing intergenerational care in the community by organising crafts and music activities for residents of Devonshire House Care Home and the children. Read more about the benefits of intergenerational care here. All at Woodpeckers Private Nursery are seeing a bright future and want to continue to offer French lessons, ‘Cheeky Chimps Music’, and ‘Diddy Dance’, as well as planning to get a qualification in ‘Hygge’ in their setting. “We love to hear from our children when they come back for a visit and tell their stories. We’ve often had former pupils coming on work experience placements. We’re very proud of the wonderful young adults they have become, and we feel privileged that we have played a part in their early lives,” said Deidre Micklewright to East Anglian Daily Times.